In the spring of 1988 Danny Shain, a young artist working for Cooke's Crating, was dispatched to the Santa Monica studio of Richard Diebenkorn. His job was to help the renowned painter pack up the contents of his studio in preparation for a move to Healdsburg, California. Shain, who remembers being a bit starstruck, did what he could to express to the older artist how much he appreciated his work. "Diebenkorn was very pleasant," Shain recalls, "but I could tell that he was not thrilled about people telling him how great he was." Because Shain knew enough about Diebenkorn's work to understand that a move to another location work would undoubtedly influence the artist's direction, he also gently asked about the reason for the move. Diebenkorn replied that he had been in Santa Monica "as long as anybody should be." As the job progressed, Diebenkorn generously offered Shain various items including an old stepladder. 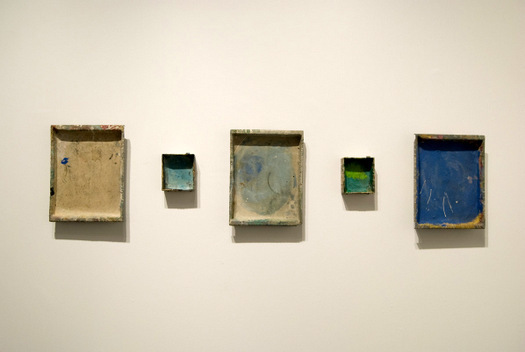 Diebenkorn was a bit puzzled when the young man asked if he could also take home some of the trays that he had used to mix oil paint. "They are just photo developing trays: you can get new ones." he told Shain. They are now treasured items: "...the poetic shadow of his work," Shain remarks, "a journal of sorts of the making of his Ocean Park paintings." Looking back, Shain remembers thinking a sad thought during the job: "This may be the end of the Ocean Park Paintings." In fact, it was. In his Healdsburg studio Diebenkorn worked mostly on a smaller scale, and the change in location brought a change in imagery. The artist's productivity was also greatly reduced by health problems that plagued him prior to his death in March of 1993. Naturally, when he heard about the exhibition "Richard Diebenkorn: The Ocean Park Series," which was on view at the Orange County Museum of Art between February 26th and May 27th, Shain made a point of visiting the show. "I went with my family," Shain says. "I loved it." He wasn't alone in his enthusiasm. Before it closed, more than 21,000 visitors came to view OCMA's presentation of more than 75 Ocean Park paintings, prints and drawings, the largest selection ever seen on view together. During the run of the exhibition it became clear just how many people have an intense devotion to Diebenkorn's "Ocean Park" paintings. Diebenkorn himself has become a cult figure, and the chance to see his "Ocean Parks" in Newport Beach, an hour south of where they were painted, was a kind of pilgrimage. Diebenkorn aficionados came from across the U.S. and from as far away as Great Britain. OCMA intern Sarah Waldorf reports that a couple who came from Georgia saw the exhibition three days in a row: "They would arrive at 11AM sharp and leave right before closing. Every day they spent the whole day in the exhibition." Pulitzer prize-winning art critic Sebastian Smee flew in from Boston and wrote that "To stand before these austere but drenchingly beautiful canvases is as close as art gets to the feeling of taking refuge on a cold day under a warm shower." A New York couple who had dropped by MOMA in New York were told that the Diebenkorn they had hoped to see was on loan to OCMA; they immediately booked a flight west. The visitors desk at OCMA reports having often called taxis for people who came directly from the airport and then went straight back after getting their fill of Diebenkorn. Many people made multiple visits; I personally saw the show three times. Derek Allison, a northern Californian who regularly comes south for business, dropped in four times. Painter Mark Dutcher, who saw the show three times, found the "Ocean Park Series" profoundly moving and compelling. "It was like a master's class in studio painting; a slowed down and deliberate painterliness sustained over twenty years. It brought me to my knees and was such a great reminder of what it means to be an artist and that being in the studio is all that matters." Curator Sarah Bancroft, the show's organizer, had the privilege of seeing the show daily: "It was a daily meditation that just kept giving," Bancroft reports. "I did my hardest looking the day before the show closed." Bancroft, who had worked hard at hanging and arranging Diebenkorn's works, had her own personal names for some of the spaces, one of which she dubbed "The Diebenkorn Chapel." "What I casually referred to as the Diebenkorn Chapel was the space listed in the gallery guide as Gallery Seven. I called it the "chapel" because the works (c.1979-1980) that I hung there were very sumptuous, subtle, pastel, and it had a very quiet, light-infused, lovely feel. Three of the four paintings in particular (OP #109, OP #116, OP #122) did not have high contrast, and they really just took off and sang together. That room was like the "apotheosis of Ocean Park;" like being in heaven or going to heaven with Ocean Park." "All I did with the docents who came to the workshop was offer ways for them not to think the paintings as they were in their presence. I gave them ways to see them not with their eyes, but with other portals through which vivid life is known when we turn aside from thinking/seeing and allow the bigness of what we are to engage what is right before us. The result was completely spontaneous and authentic writing, some of which took my breath away, or drove it more deeply in to where I could feel it, myself, alive. I wasn't the only one who felt this way listening - there were many signs that the writing was getting through, and not a few tears of joy, recognition and relief." The day before the exhibition closed, Sarah Bancroft came across a man named Chris who was practicing Ki Gong in an opportune corner. "He looked like he was trying to commit the room to memory; he said he was meditating on all the works in Gallery Three plus the sight lines from Galleries Two and Four." His placement, comments Bancroft, was "perfect." As soon as the show ended -- after extended hours had been declared to accommodate the final crowds -- OCMA's handlers began the melancholy task of preparing the Ocean Park paintings for their trip to the Corcoran Gallery in Washington. Each painting was carefully packed in a custom crate, ready to be accompanied by courier to its next destination. It may be decades before another major Diebenkorn show comes along, and there is always the chance that "Richard Diebenkorn: The Ocean Park Series" will be the largest show ever organized. Collectors and institutions cherish their Diebenkorns, and after the Corcoran viewing the Ocean Parks will all be returned to their permanent homes in museums and private collections. "Ocean Park #90," which was on view only at Newport, is already back in billionaire Eli Broad's bedroom. Saying "goodbye" to Diebenkorn's paintings won't be easy for his fans, but while they were at OCMA many, many people took the time to look them over carefully, and felt their pull. After viewing the exhibition five times in 24 hours Peter Levitt told his wife "I don't want to live anywhere where I'm not surrounded by these paintings." Many viewers were struck by how "right" it felt to see the works in Newport. "It was akin to seeing a Cezanne exhibition in the south of France," remarks Danny Shain. For Shain, and for so many people who love Diebenkorn's work, the connection is personal and deeply felt. It is the same way for me. 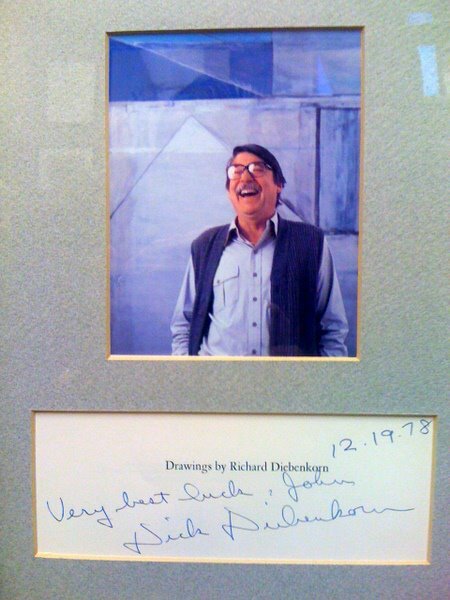 I was invited to Diebenkorn's home in 1978, and a momento of the visit hangs in my office to this day. Diebenkorn was, and still is, someone I look up to. In my mind's eye I can still see him closing the front gate as I left, with his dog barking behind him. It was hard to say goodbye then too.